Thanks for stopping by Murray's Cheese! Receive 10% off your first online purchase when you subscribe to CheezE-mail. 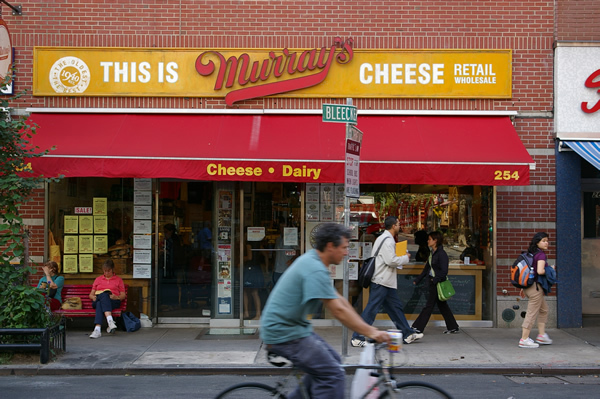 Founded in 1940 by Murray Greenberg, Murray's Cheese has long been a fixture of New York's Greenwich Village. Along with neighboring food destinations Faicco's, Ottomanelli's and Rocco's, Murray's is part of the rich food history of this formerly Italian enclave. Initially a wholesaler of butter and eggs, Murray's has evolved into New York's (and the United States') best loved cheese shop. Over the past 20 years, proprietor Rob Kaufelt has turned Murray’s into a world-renowned destination that offers the rarest and finest cheese. Murray’s businesses also include a wholesale group that sells to top restaurants, hotels and caterers; a mail order business, a second retail outlet at Grand Central Terminal and an expanded product line of cured meats. In 2004, Rob added a classroom, cheese aging caves and a prepared foods department to the line-up. In 2009, Murray's entered into an agreement with Kroger, the nation’s largest retail grocery chain, to expand Kroger’s specialty cheese program. Murray’s Cheese shops can now be found in Atlanta, Birmingham, Cincinnati, Dallas, Denver, Houston, Knoxville, Seattle, and Portland. Use our handy store locator to find a mini-Murray’s near you. Cheese sampled at the shop!